Download "EveryTM. Coverage. 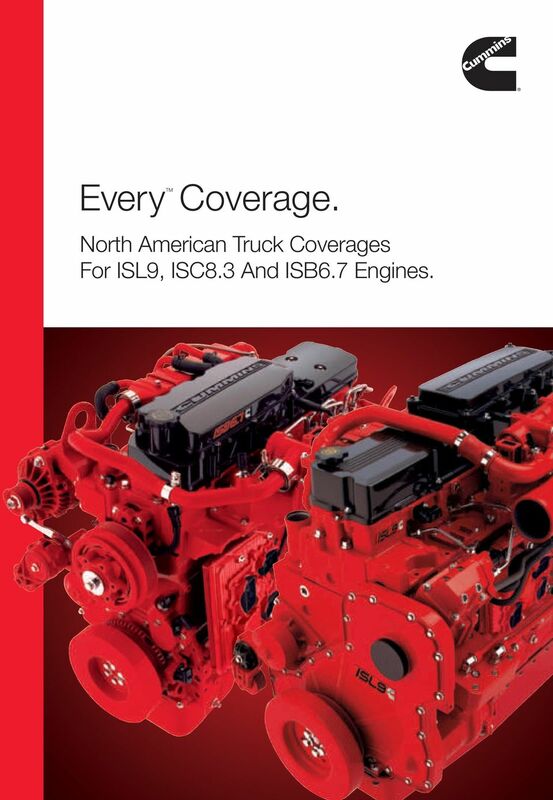 North American Truck Coverages For ISL9, ISC8.3 And ISB6.7 Engines." 1 EveryTM Coverage. North American Truck Coverages For ISL9, ISC8.3 And ISB6.7 Engines. 2 EveryTM Confidence. You can have confidence knowing that your EPA 2010 engine is backed by the total coverage of Cummins base and extended warranty coverage plans. Every major component from the air handling to the exhaust aftertreatment* including those in the Selective Catalytic Reduction (SCR) system is included under the base warranty. 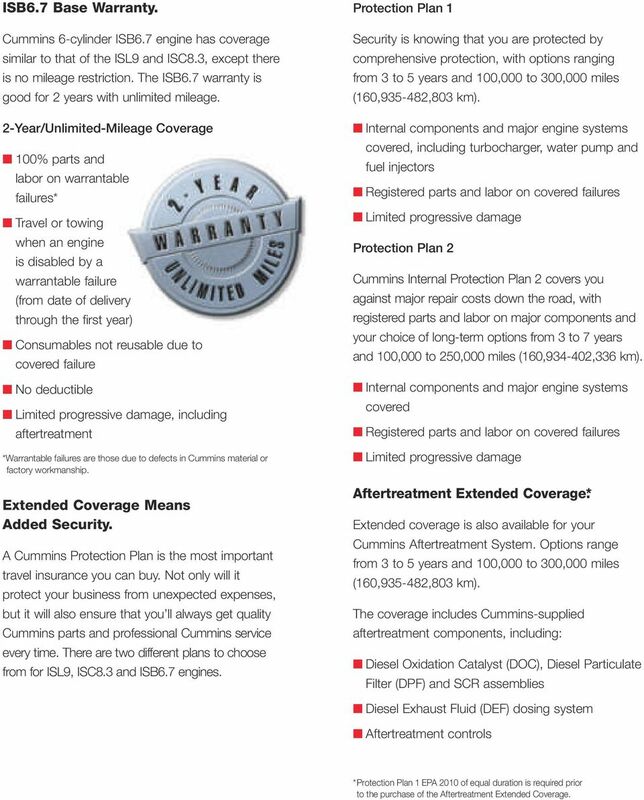 In addition to the base warranty, Cummins offers a selection of extended coverage plans that provide extra protection for your business against major unexpected repair expenses. No matter where your business takes you, you ve always got a Cummins-authorized service facility nearby, with over 3,500 locations in North America. Best of all, they ll handle every bit of paperwork associated with your warranty repair. *Does not include air cleaner, intake pipes, exhaust pipes or mounting hardware. ISL9 And ISC8.3 Base Warranty. The base warranty for these engines is even more comprehensive than its previous coverage. Good for 2 years/250,000 miles (402,336 km), whichever occurs first, it includes virtually everything at no additional cost: 2-Year/250,000-Mile (402,336-km) Coverage 100% parts and labor on warrantable failures* Travel or towing when an engine is disabled by a warrantable failure (from date of delivery through the first year) Consumables not reusable due to covered failure No deductible Limited progressive damage, including aftertreatment *Warrantable failures are those due to defects in Cummins material or factory workmanship. 3 ISB6.7 Base Warranty. Cummins 6-cylinder ISB6.7 engine has coverage similar to that of the ISL9 and ISC8.3, except there is no mileage restriction. The ISB6.7 warranty is good for 2 years with unlimited mileage. 2-Year/Unlimited-Mileage Coverage 100% parts and labor on warrantable failures* Travel or towing when an engine is disabled by a warrantable failure (from date of delivery through the first year) Consumables not reusable due to covered failure No deductible Limited progressive damage, including aftertreatment *Warrantable failures are those due to defects in Cummins material or factory workmanship. Extended Coverage Means Added Security. 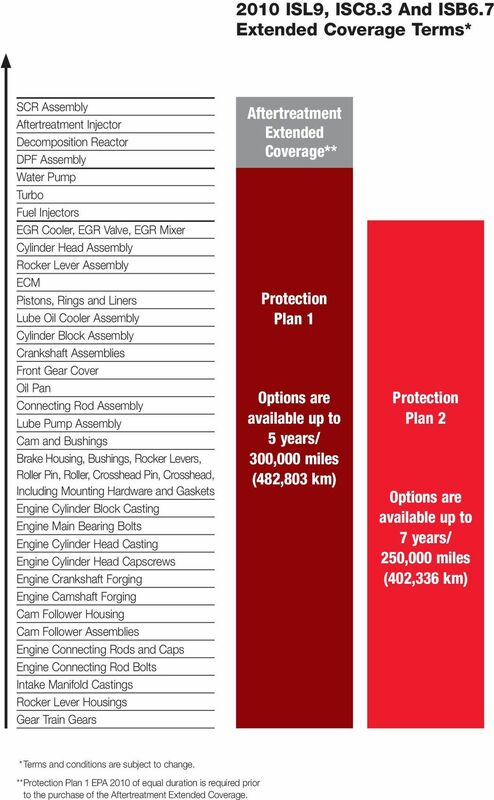 A Cummins Protection Plan is the most important travel insurance you can buy. Not only will it protect your business from unexpected expenses, but it will also ensure that you ll always get quality Cummins parts and professional Cummins service every time. There are two different plans to choose from for ISL9, ISC8.3 and ISB6.7 engines. Protection Plan 1 Security is knowing that you are protected by comprehensive protection, with options ranging from 3 to 5 years and 100,000 to 300,000 miles (160, ,803 km). Internal components and major engine systems covered, including turbocharger, water pump and fuel injectors Registered parts and labor on covered failures Limited progressive damage Protection Plan 2 Cummins Internal Protection Plan 2 covers you against major repair costs down the road, with registered parts and labor on major components and your choice of long-term options from 3 to 7 years and 100,000 to 250,000 miles (160, ,336 km). Internal components and major engine systems covered Registered parts and labor on covered failures Limited progressive damage Aftertreatment Extended Coverage. * Extended coverage is also available for your Cummins Aftertreatment System. Options range from 3 to 5 years and 100,000 to 300,000 miles (160, ,803 km). The coverage includes Cummins-supplied aftertreatment components, including: Diesel Oxidation Catalyst (DOC), Diesel Particulate Filter (DPF) and SCR assemblies Diesel Exhaust Fluid (DEF) dosing system Aftertreatment controls * Protection Plan 1 EPA 2010 of equal duration is required prior to the purchase of the Aftertreatment Extended Coverage. 4 2010 ISL9, ISC8.3 And ISB6.7 Extended Coverage Terms* SCR Assembly Aftertreatment Injector Decomposition Reactor DPF Assembly Water Pump Turbo Fuel Injectors EGR Cooler, EGR Valve, EGR Mixer Cylinder Head Assembly Rocker Lever Assembly ECM Pistons, Rings and Liners Lube Oil Cooler Assembly Cylinder Block Assembly Crankshaft Assemblies Front Gear Cover Oil Pan Connecting Rod Assembly Lube Pump Assembly Cam and Bushings Brake Housing, Bushings, Rocker Levers, Roller Pin, Roller, Crosshead Pin, Crosshead, Including Mounting Hardware and Gaskets Engine Cylinder Block Casting Engine Main Bearing Bolts Engine Cylinder Head Casting Engine Cylinder Head Capscrews Engine Crankshaft Forging Engine Camshaft Forging Cam Follower Housing Cam Follower Assemblies Engine Connecting Rods and Caps Engine Connecting Rod Bolts Intake Manifold Castings Rocker Lever Housings Gear Train Gears Aftertreatment Extended Coverage** Protection Plan 1 Options are available up to 5 years/ 300,000 miles (482,803 km) Protection Plan 2 Options are available up to 7 years/ 250,000 miles (402,336 km) * Terms and conditions are subject to change. ** Protection Plan 1 EPA 2010 of equal duration is required prior to the purchase of the Aftertreatment Extended Coverage. 5 Pricing. 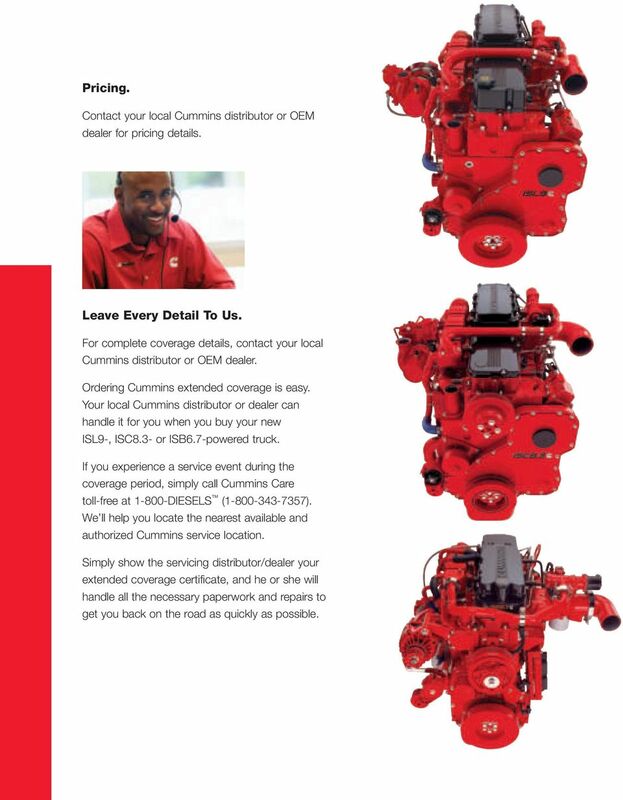 Contact your local Cummins distributor or OEM dealer for pricing details. Leave Every Detail To Us. For complete coverage details, contact your local Cummins distributor or OEM dealer. Ordering Cummins extended coverage is easy. 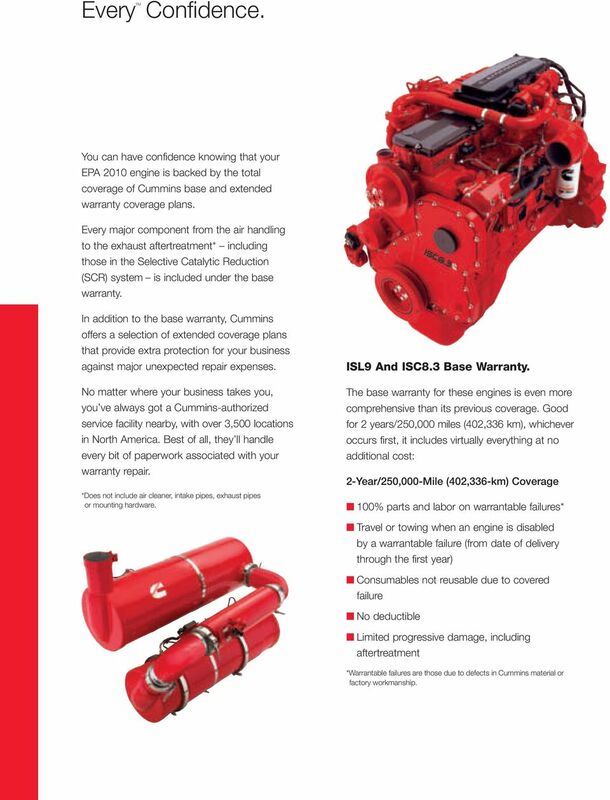 Your local Cummins distributor or dealer can handle it for you when you buy your new ISL9-, ISC8.3- or ISB6.7-powered truck. If you experience a service event during the coverage period, simply call Cummins Care toll-free at DIESELS ( ). We ll help you locate the nearest available and authorized Cummins service location. Simply show the servicing distributor/dealer your extended coverage certificate, and he or she will handle all the necessary paperwork and repairs to get you back on the road as quickly as possible. 6 Cummins Inc. Box 3005 Columbus, IN U.S.A. Phone: DIESELS ( ) Fax: Internet: cumminsengines.com Twitter.com/CumminsEngines YouTube.com/CumminsEngines Bulletin Printed in U.S.A. Rev. 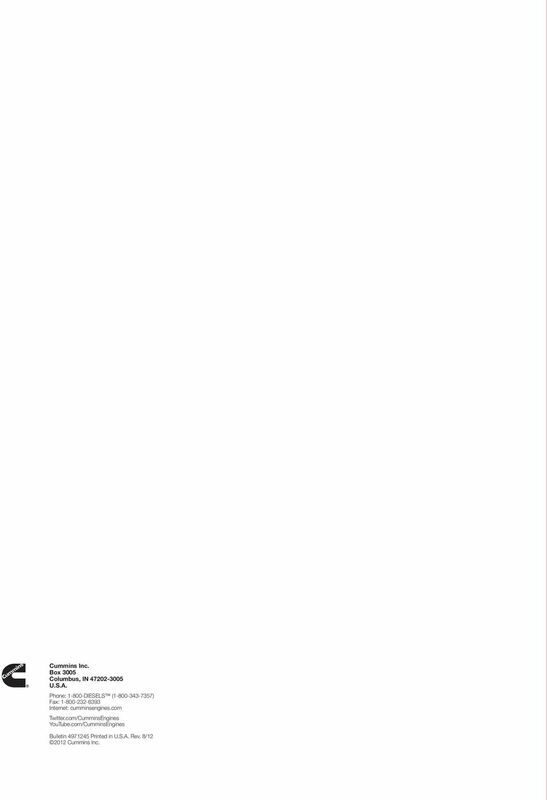 8/ Cummins Inc.
introduction Welcome to Midwest Motorcycle Supply s Engine Reference Guide.